Farm-to-table has been having a moment — but now “sea-to-table” is, too. 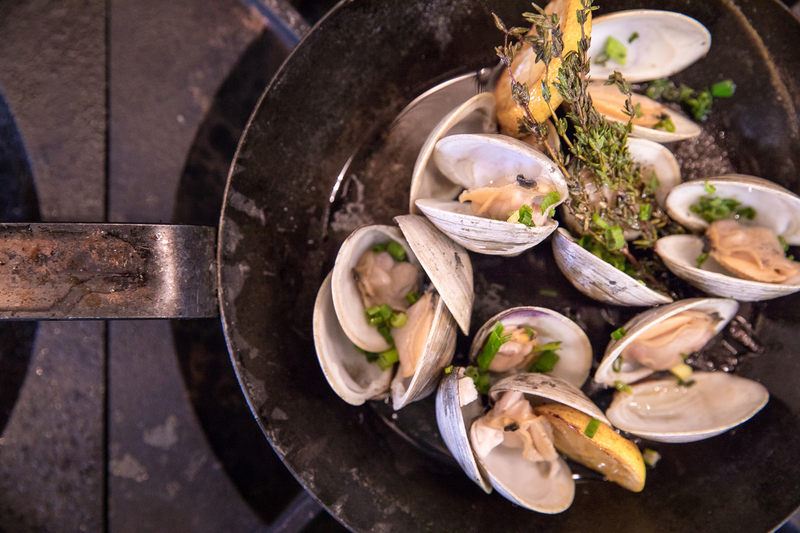 For chefs Bill Hartley and James Clark of Postal Seafood Company, cooking local seafood like wild Swansboro clams “has always been a way of doing things.” Photo by Forest Mason. 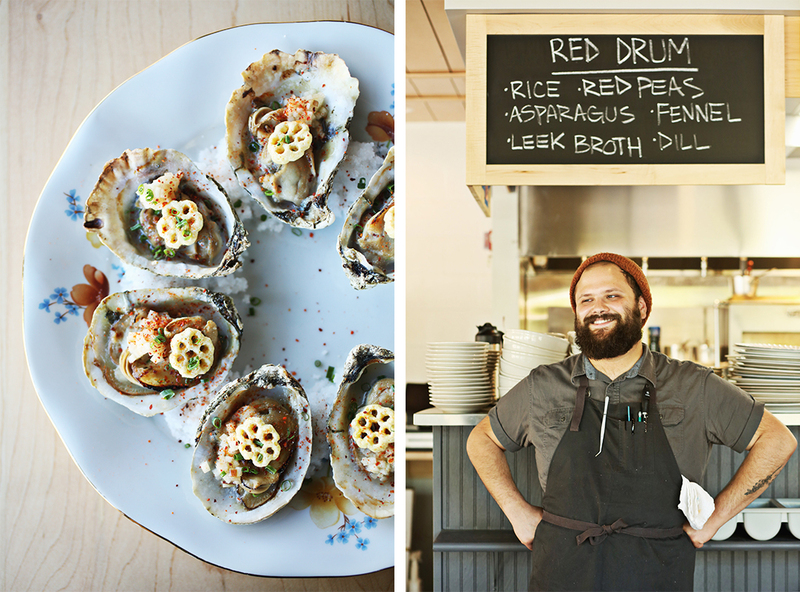 “When I opened up Saltbox, I wasn’t trying to be trendy,” chef Ricky Moore says. 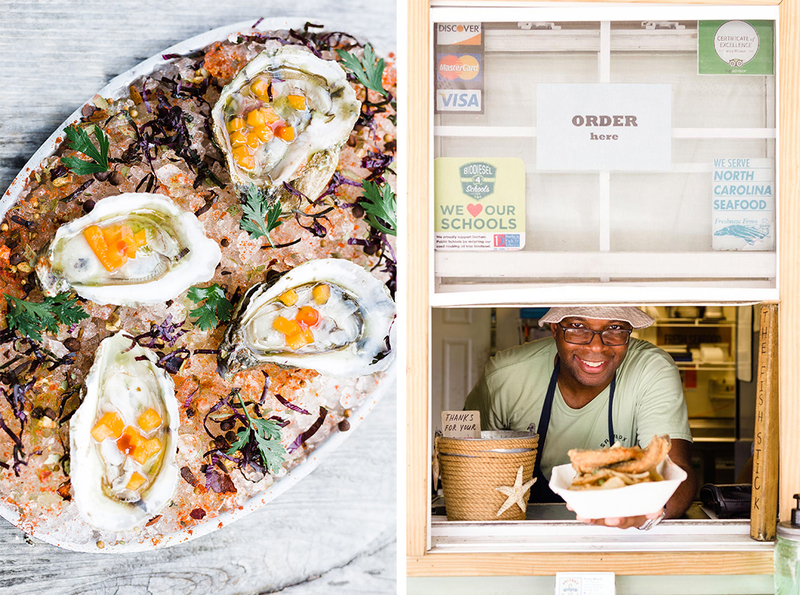 A small walk-up counter, Saltbox Seafood Joint quickly became recognized as one of the top places to get fresh seafood in the Triangle. Now with two locations in Durham, the restaurant has gained local and national acclaim for its use of North Carolina seafood and traditional recipes. Growing up in New Bern, Moore was raised on local flavors that he brings to his customers. With the restaurant scene flourishing in the Raleigh/Durham/ Chapel Hill area — also known as the Triangle — more establishments are taking advantage of the bounty of seafood products from our coast. Chef Chris Lopez at Postmaster has high standards for the food he serves, which is why he often uses local N.C. seafood in recipes like honeycomb oysters. Photos by Juli Leonard/The News and Observer. 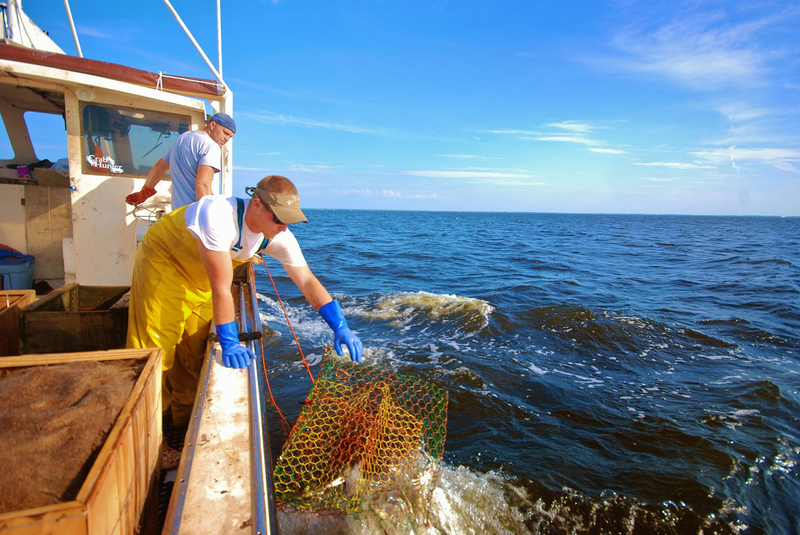 North Carolina boasts over 300 miles of oceanfront and thousands of miles of estuary shorelines, ready access to water flush with coastal resources like shrimp, crab, flounder and oysters. But at restaurants inland, finding North Carolina seafood can be difficult at times. To get fresh N.C. seafood to the Triangle “has been very challenging logistically,” Kelly says. It’s often more cost-effective for N.C. restaurants to get their products from distributors who source seafood from outside the state. This has led many restaurants to carry non-native salmon or cod. “There are several barriers to getting North Carolina seafood to inland markets,” explains Barry Nash, North Carolina Sea Grant’s seafood technology and marketing specialist. According to Nash, varied factors— the lack of labor; harvest regulations restricting the supply of coastal products; low capacity to process local products into ready-to-cook products; and underdeveloped supply chains — have limited the amount of N.C. seafood available inland. Yet, despite the obstacles, North Carolina seafood is becoming more common away from the coast. Inland restaurants featuring native seafood have not just been surviving, but thriving — catching the eyes of restaurant-goers and food critics alike. “National market research indicates people prefer locally grown or harvested foods over imports when given a choice,” Nash says. In the Triangle, the increase in N.C. seafood may be related to the growing restaurant scene inspired by the area’s rapid population growth, or by local chefs investing in their community. It could also be related to the farm-to- table movement and growth of local farmers markets. Regardless, the sea-to-table movement shined in the Raleigh News & Observer’s ranking of the best new restaurants of 2018. Ricky Moore of Saltbox Seafood Joint, Matt Kelly at Saint James Seafood, and chefs James Clark and Bill Hartley of Pittsboro’s Postal Fish Company elevated their three seafood restaurants into the top-10 list. 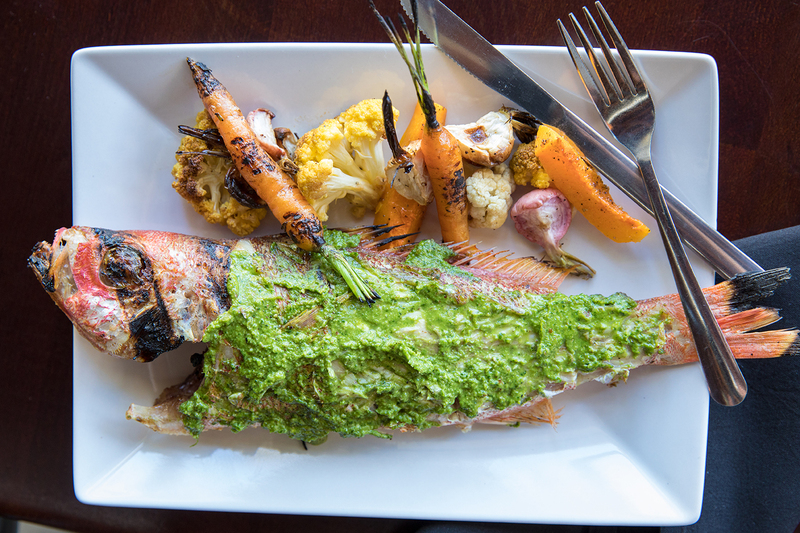 A fourth, Postmaster — with chef Chris Lopez at the helm — had drawn recognition previously for its use of “market catch” fish. The N&O also named Saint James the best seafood restaurant in the Triangle and gave it an honorable mention for best restaurant overall for 2018. The menu at Postal Fish Company changes frequently, so that fish like beeliner are available without delay. 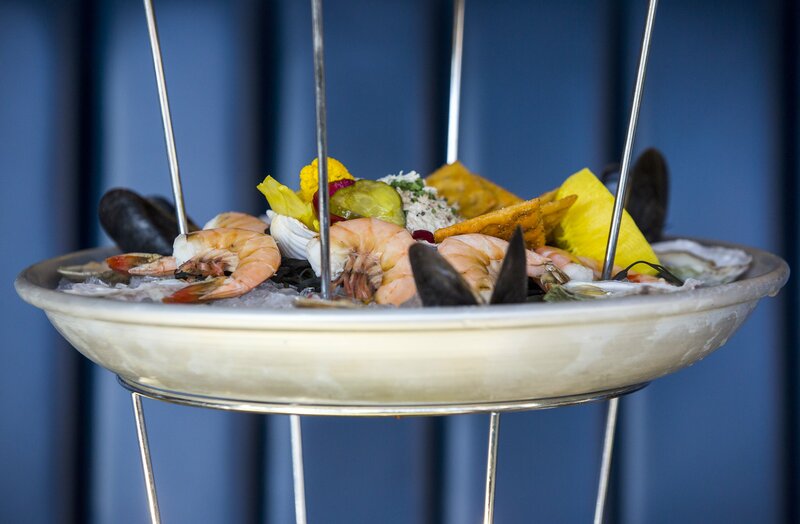 To ensure freshness, chef-owners James Clark and Bill Hartley use seafood only from North Carolina, South Carolina and Virginia. Photo by Juli Leonard/The News and Observer. For Clark, sea-to-table has “always been a way of doing things.” Postal Fish Company utilizes seafood from only North Carolina, South Carolina and Virginia. This choice is partially due to Clark’s upbringing in Elizabeth City and his early-career experiences working with commercial fishermen in South Carolina. There, he learned the benefits of using seafood off the docks, particularly underutilized species. “My philosophy is to try and get the best quality fish as local as I can get it,” he says. At Saint James, Kelly takes a similar approach. Outside of strictly seafood-serving restaurants, others are taking advantage of North Carolina’s coastal resources by featuring a “fresh catch” or “catch of the day” option. “We take pride in sourcing locally whenever we can,” says Lopez, the chef at Postmaster, which opened in 2017 in Cary. Postmaster’s menu changes seasonally to maximize the elements of a dish the restaurant can source locally. These Albemarle Sound fishermen catch blue crabs, establishing the first link in the supply chain for Locals Seafood, a prominent distributor serving the Triangle. Photo courtesy of Locals Seafood. Assisting these chefs in their mission are distributors like Locals Seafood. Owners Lin Peterson and Ryan Speckman first started selling shrimp out of a cooler on the side of the road. Now, their business has evolved into a multifaceted approach that brings seafood from the coast to the piedmont. Locals boasts an impressive list of customers totaling over 50 restaurant clients, including Postmaster, Saltbox and Postal. By working directly with fishermen and fish houses and making three to four trips a week to the coast, the distributor regularly has fresh seafood available to sell to restaurants, grocery stores and the public. Forging and maintaining relationships with fishing communities and Triangle customers is vital. “We are always working with chefs and are in communication with them, because our product changes,” Greene says. Weather, season and ocean conditions are all factors that could affect the daily or weekly catch. Clark and business partner Hartley drive down to the coast as regularly as they can. There, the duo will meet with fishermen to see what they are bringing in. They also work closely with suppliers like Salty Catch, with commercial fisherman Steve Goodwin transporting his catch himself to Pittsboro. Chef Ricky Moore of Saltbox Seafood Joint says feasting on local seafood ought to be an everyday occasion. Starting as a simple walk-up counter, Saltbox has recently expanded to a second, sit-down location. Photos by Baxter Miller. After getting the seafood to the Triangle, a second challenge arises. When customers see the names of North Carolina fish on the menu, they aren’t always familiar with them. Many people prefer fish commonly found on menus like salmon, which aren’t native to the N.C. coast. Saint James’s Kelly agrees. “When you buy local fish, I can’t always give you a standard cut of flounder.” Grouper, triggerfish, sheepshead and cape shark are just a few of the species seasonally available on our coast. But put them on the menu, and some customers may be cautious. Moore, Lopez, Kelly and Clark all stress transparency, honesty and direct communication with their customers. “When we have a unique fish on the menu, we try to compare it to a commonly known fish, so people have a jumping-off point,” Lopez says. This familiarity can help Postmaster customers “comfortably step out of their comfort zones.” Sheepshead, for example, has a similar flavor profile to catfish or mahi-mahi, which all have a light to moderate flavor. Having wait staff who are familiar with the products also helps. “They have to go out there and sell it,” Clark says. With this in mind, he trains his staff to be prepared to answer any questions that may come their way about the seafood they are serving. A slow and steady approach to building trust now allows Moore to offer lesser-known species of native fish on a daily basis. This dish, served at Saint James Seafood in Durham, boasts a seafood medley. Photo by Casey Toth/The News and Observer. Lopez says Postmaster includes some nontraditional species and seasonally changes their menu. They create their recipes around the seafood that is available, using the flavor profile, size and texture of the fish. “With our customer base, we can put any fish on the menu, as long as it tastes good,” he says. But are appetites actually growing for local seafood? Despite the challenges North Carolina seafood may present, customers are buying what these chefs are selling. Other successful N.C. chefs — like Ashley Christensen, Vivian Howard and Jason Smith — have embraced using local products and seafood on their menu to great acclaim. Sea Grant’s Nash also has seen hints of increased acceptance of local fish. “Consumer research conducted by Sea Grant with cultured sturgeon, lionfish and cape shark indicates that people are hungry — some pun intended — for unfamiliar marine species,” Nash says. For Moore’s part, he wants to make eating North Carolina seafood as normal as possible. This article was published in the Spring 2019 issue of Coastwatch. For reprint requests, click here.